Köln-Düsseldorfer (KD) offer cheap day trip cruises on riverboats on Rhine River (Rhein) from Cologne, Bonn, and Düsseldorf, to Remagen, Linz, and Koblenz. Köln-Düsseldorfer (KD), the largest operator of day cruises on the Rhine River (Rhein), offer many roundtrip cruises in both Cologne (Köln) and Düsseldorf. However, most Rhine River day cruises on this section of the Rhein are from Bonn to Linz. Many more cruises are available in the Middle Rhine (Loreley) Valley between Koblenz and Rüdesheim / Bingen. Rhine River day pleasure boat cruises are generally available from late March to end October. 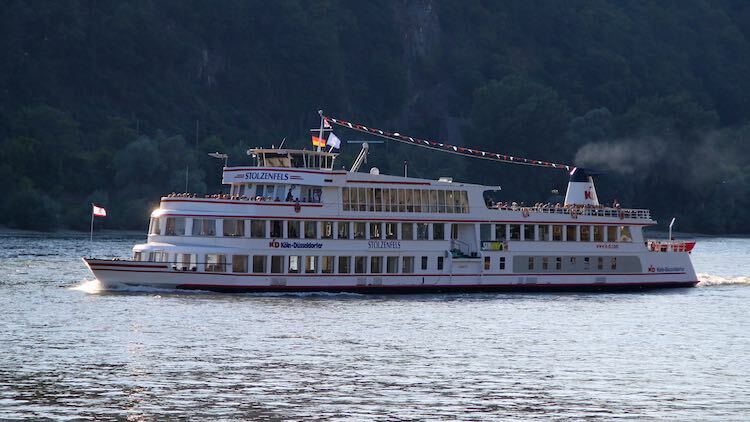 The high season is from late April to early October when more Rhein cruises are operated. Winter cruises on the Rhine is rare but sightseeing cruises in Cologne (Köln) and Düsseldorf are popular during the Christmas market Advent season. Not sold by KD itself but available from tour operators such as Get Your Guide is the KD RhinePass which allows unlimited cruising for a day on all KD boats for €32 – quite a good deal if planning to go for a long cruise. Note a paper printout is usually required. Most Rhine pleasure boats cruises in this region are from Bonn to Linz and back but occasionally Rhine boats are available from Cologne (Köln) or continue all the way to Koblenz. Boats cruising upstream from Bonn to Linz take two hours while the downstream return is only 85 minutes. Very frequent trains between Köln Hauptbahnhof (Cologne Main Station) and Bonn take between 15 and 30 minutes. Two trains per hour connect Linz (Rhein) and Cologne (with stops amongst others in Bonn) in an hour. Show the train (or bus) ticket when buying boat tickets – KD usually gives 20% discount on the cruise. See Deutsche Bahn train schedules online: Cologne to Bonn, Cologne to Linz and Cologne to Koblenz. Full Mainz, or even Koblenz, to Cologne day cruises are no longer possible on the standard schedule and timetables. The longest cruises during the high season are Bonn to Rüdesheim or vice versa with a boat change in Koblenz. Cologne (Köln) has the most picturesque city skyline by far of any Rhine River city. Cologne is a popular departure point for round trip sightseeing cruises, sometimes also referred to as panorama cruises. Roundtrip sightseeing cruises from Cologne are usually around an hour but longer cruises are also available to include coffee breaks, dancing, lunch, and dinner cruises. Köln-Düsseldorfer (KD) has the most cruises by other cruise lines such as Kölntourist also offer roundtrip cruises from Cologne. The differences are minimal but in some cases special discount fares may give one company a price advance. Köln-Düsseldorfer (KD) has many hour-long sightseeing cruises on the Rhine River from Düsseldorf. Düsseldorf has a decidedly modern skyline and wide curves in the Rhine River make for interesting vistas too. Köln-Düsseldorfer also has occasional day trips from Düsseldorf to Cologne, to medieval Zons, or to Duisburg, the largest inland harbor in Europe. The most popular section of the Rhine (Rhein) River for daytrips cruises is the romantic Middle Rhine (Mittelrhein) between Rüdesheim / Bingen and Koblenz. The Middle Rhine is inscribed on the UNESCO World Heritage list and includes the Loreley Rock, numerous castles, and romantic villages. Day cruises generally do not go from Cologne to the Loreley Valley. However, very frequent trains from Cologne (Köln) to Bingen take 90 minutes to 2 hours (transfers may be required in Koblenz). Bingen is on the left bank of the Rhine opposite Rüdesheim and a great place to start a Rhine River day cruise of the Loreley Valley. Trains from Koblenz to Cologne take just less than an hour. Köln-Düsseldorfer (KD) offers many special savings fares on its day cruises on the Middle Rhine (Loreley Valley) that are also valid on valid on cruises from Bonn and Cologne.